William Grant has released an exclusive Tullamore Dew 14 Year Old single malt finished in Sherry casks into European travel retail. Available exclusively at Nuance outlets in the retailer’s key European airports, the oldest Tullamore Dew to date has been positioned strategically to drive premiumisation of the brand. 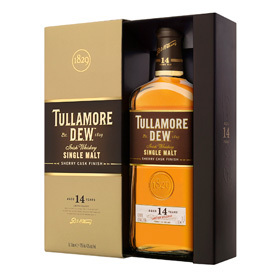 Aged for 14 years before being finished for eight months in oloroso Sherry casks, the Tullamore Dew 14 Year Old is packaged in one-litre bottles within a gift box featuring the new packaging designs unveiled earlier this year. Its flavour is described as “a complex and rounded single malt taste, with the fruitiness of ripe berries… and a sweet spice note with hints of cinnamon and nutmeg”. The expression will be initially available in Zurich, Antalya, Arlanda (Stockholm) and Lisbon airports, with Malta and Geneva set to follow. “We believe that global travel retail is the ideal route for driving premiumisation of the brand, with exclusives such as this 14-year-old enhancing the perception of Tullamore Dew as a premium, unique Irish whiskey, with strong whiskey credentials,” said André de Almeida, WGS Europe regional director. The launch will be supported by video tutored tastings hosted by Tullamore Dew’s global brand ambassador during the summer months.